sometimes you just need to play..
I’ve just spent a week in ‘admin mode’ catching up on accounts, updating my website and organising things for my trip to Morocco next week. Lots of time spent on the computer, lots achieved but feeling a bit jaded and in need of some creative stimulation! Taking a break from the screen, I booked myself onto the Book Arts Workshop with Art Pocket, part of the Norwich Makers Festival which has been running at The Forum this month. I went in with a ‘beginners mind’ looking forward to having a chance to learn some new skills and think outside the ‘textiles’ box for a change. 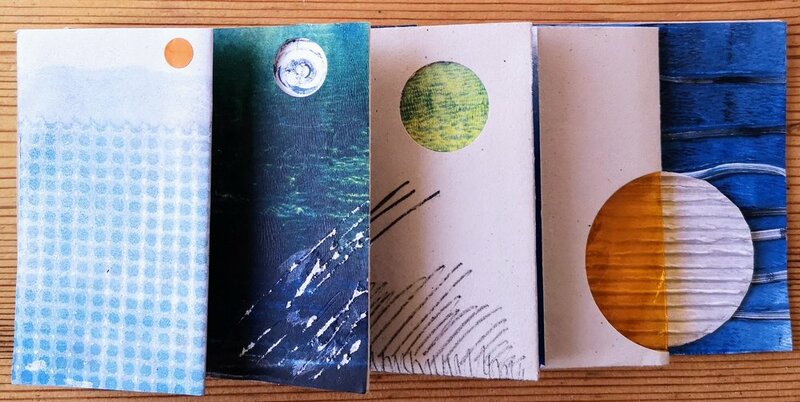 This week was the ‘super snow moon’ the brightest full moon of the year - and I based my folded book on the journey of the moon across the sky over my garden, experimenting with different types of papers, gelli printing (what fun, always wondered what that was about!) and working with cut outs, windows and layers. The 2.5 hour workshop was extremely well run by Hannelore and Becky and I left feeling inspired to experiment further. I realise how important it is to break away from our safe space sometimes and just ‘play’. It is so easy to get caught up in the day to day tasks and rush to meet deadlines, we forget to just stop for a while and try something new! thank you to all of you who have supported me through a challenging year… 2019 promises to be a year of exciting new projects, renewed creative energy and a chance to share stories and skills. Held in in a distinctive venue at The Shoe Factory Social Club at St Mary’s works and featuring over 50 makers selling their work over 3 days, FRESH is more than just a craft market! I will be running a regular makers meet up from my new studio in Aylsham on the second Saturday of each month. These small, informal sessions offer you the chance to get some help and inspiration from me for your textiles projects and share ideas and conversation with others. It was lovely to see some of you at the various workshops held at my Norwich studio over the summer, we explored slow stitch, natural colour, print making, mud resist and of course indigo dyeing and next week will be enjoying another of the very popular Japanese Boro stitch days with Hiroko Aeno Billson.